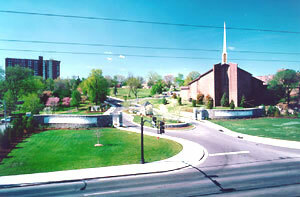 Trevecca Nazarene University moved to its present location on Murfreesboro Road in 1935 and in 1998 showed a new face to the city of Nashville with the new entrance. Trevecca Nazarene University began in 1901. The Reverend J. O. McClurkan, a Cumberland Presbyterian minister, established the institution dedicated to training Christian workers for the United States and foreign countries as the Pentecostal Literary and Bible Training School for Christian Workers. First established in Nashville in the old Hynes School Building on Jo Johnston and Fifth Avenues, the school moved to a new location on Fourth Avenue behind the Ryman Auditorium in 1905. In 1910 the trustees enlarged the curriculum to become a four-year college and changed the name to Trevecca College, a name taken from a school in Wales founded in 1768 during the Methodist Wesleyan revival. In 1914 the school moved again to the former Percy Warner estate, Renraw, on Gallatin Road. In 1917 the Church of the Nazarene officially adopted the school. Trevecca became a junior college in 1932. In 1935 it relocated to its present site at 333 Murfreesboro Road and rechartered as Trevecca Nazarene College. The school’s program and curricular offerings expanded in 1940 with the addition of a third year of college work. In 1941 the state granted Trevecca the right to confer the A.B. degree (the first baccalaureate degrees were awarded in 1942) and approved the college’s teacher education programs in 1955. The Southern Association of Colleges and Schools granted accreditation in 1969. Beginning in 1978 with the accreditation of Tennessee’s only Physician Assistant Program, Trevecca expanded degree programs to meet the changing needs of students: graduate programs were instituted with a master’s of education in 1984, followed by a master’s in religion (1987), in counseling (1991), and in organizational management (1992). A degree-completion program for nontraditional students began in 1988. In 2001 the university offered forty-three different baccalaureate degrees. Presidents of Trevecca who served during the years of expansion and growth include A. B. Mackey (1936-63), William M. Greathouse (1963-68), Mark R. Moore (1968-79), Homer J. Adams (1979-91), and Millard Reed (1991-present), under whose administration Trevecca achieved university status in 1995.